Act! is a contact database program that enables you to store important details about the people you do business with. When you use Act! you can easily be prepared with recent emails, meeting notes, task reminders, documents and social media profiles. All of the data is centralised into one place that is accessible by anyone that has the Act! program and a log in. This means that you can see all of the interactions that your co-workers are having with the contacts in your database and see all of their upcoming activities in the calendar. Relationships are the heart of your business and key to fueling growth. Make every interaction count with quick, organized access to highly personalized customer details, so it's easy to build lasting relationships. Because every business runs differently, you have the freedom to tailor an Act! Why would I need a Contact Manager like Act!? There are many reasons why people require a Contact Manager, the most common being frustration with multiple data sources – email programs, excel sheets, accounting, sales people etc. If you’re not sure if CRM is what your business needs ask yourself “if a sales person left your business tomorrow – would I be able to immediately pick up where they left off?” Businesses that don’t have a centralised contact database would say no. If your business wants to be in control of your customer and contact data a CRM program is the best tool to use. Keep rich contact details, emails, documents, notes, history, activities, social media updates, and more in one, easy to find place — the Act! contact record. Organise similar contacts into groups and companies to deliver targeted communications. Track and prioritise meetings and activities associated with your contacts to stay productive. Benefit from alerts that keep you on top of your customer commitments. Why choose Act! as CRM for your business? Cost Effectiveness Act! gives you the best “bang for your buck” – no other CRM can offer the depth of features available in Act! for a competitive price. Product Popularity Act! has been around for a long time and is continually adapting to meet the changes of its users and the marketplace. Flexibility Act! is one of the most flexible and customisable CRM programs for small businesses in the market . Whether you just want to add some custom fields, change the layout or add more advanced functionality Act! can do what you need, and Xact Software can help you get there. Connectivity Act! has a variety of setup and connection options so you can choose where and how you access your database. Choose from accessing it on your PC, sync to your laptop, via the web, or on mobile devices. Create, send, and track professional, mobile-friendly email campaigns proven to drive sales with integrated email marketing. Manage opportunities using an out-of-the-box process or one you customise. Complete activities in each stage of the sales process to keep deals moving. 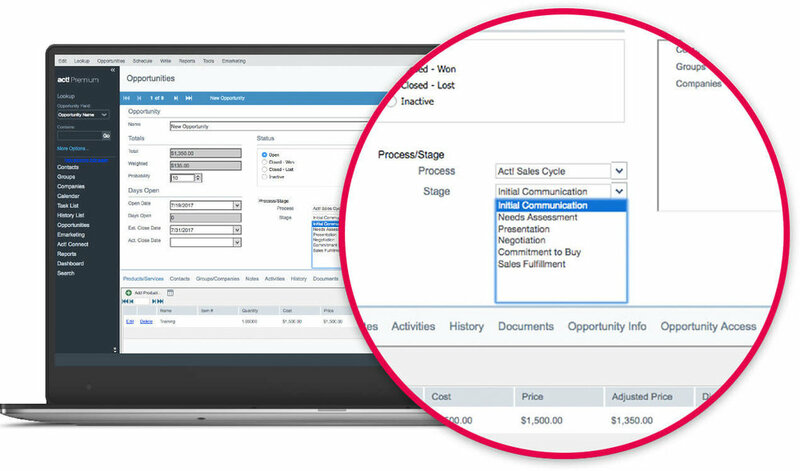 Track probability of close, products, lead source, status, and more for every opportunity for total visibility and control of your sales pipeline. Focus on the hottest leads with prioritised Call Lists1 ranked by level of campaign interaction, allowing you to contact those most interested in your campaign. Stay in the know with 50+ preconfigured reports or create custom reports with the report designer. Export reports to Microsoft® Excel, HTML, PDF, or email. Explore Act! by reading further on our website; read about how Act! works, how it can be deployed and the addons and other services available. You can also take a tour or Act! via our live demo site or request a guided demo Xact Software. If you think Act! is for you and would like to know more about how it can be fitted to your business fill in the Act! Requirements form and we will contact you with information and pricing specific to your organisation.